Hollywood’s legendary El Capitan Theatre will present a special engagement of Disney’s MARY POPPINS RETURNS from December 19 to January 13, shown in brilliant Dolby VisionTM Laser Projection & Dolby Atmos® Sound Technology. El Capitan Guests will step into Cherry Tree Lane as they enter the theatre. A holiday experience for the whole family featuring costumes from the movie, interactive Cherry Tree Lane photo ops & the debut of the all-new El Capitan Theatre curtain show with a dazzling crystal curtain! Be among the first to see MARY POPPINS RETURNS at El Capitan on Tuesday, December 18 at 7:00pm (Doors will open at 6:00PM). Tickets to The Special Opening Night at $35 include a Reserved Seat, Collectible Umbrella Popcorn Container with one refill, 20 oz Bottled Drink, Kite, and limited edition exclusive artwork poster, collectible gold heart Variety Charity pin, & movie soundtrack download, and can be purchased HERE. Regular showtimes at El Capitan for Disney’s MARY POPPINS RETURNS will take place from December 19 to January 13 daily 9:30AM, 12:55PM, 4:20PM, 7:45PM & 10:55PM (10:55PM on Opening Weekend and Fridays and Saturdays following). Showtimes and dates are subject to change. Tickets are now on sale at http://www.elcapitantickets.com, by calling 1-800-DISNEY6 and at The El Capitan Theatre box office. Special group rates for Disney’s MARY POPPINS RETURNS of $12 for parties of 20 or more are available by calling 1-818-845-3110. HARD ROCK CAFÉ MOVIE & MEAL PACKAGE: $40.00 per person. Each ticket package includes: reserved seat (no concessions) to see the movie at The El Capitan Theatre, and a meal at Hard Rock Café. Reservations are required in advance (tickets must be booked no later than 24 hrs business days). This offering is available for all showtimes December 19, 2018 – January 13, 2019. Guests will choose one entrée from special Hard Rock Cafe menu at the time of their seating. Tax & gratuity included. 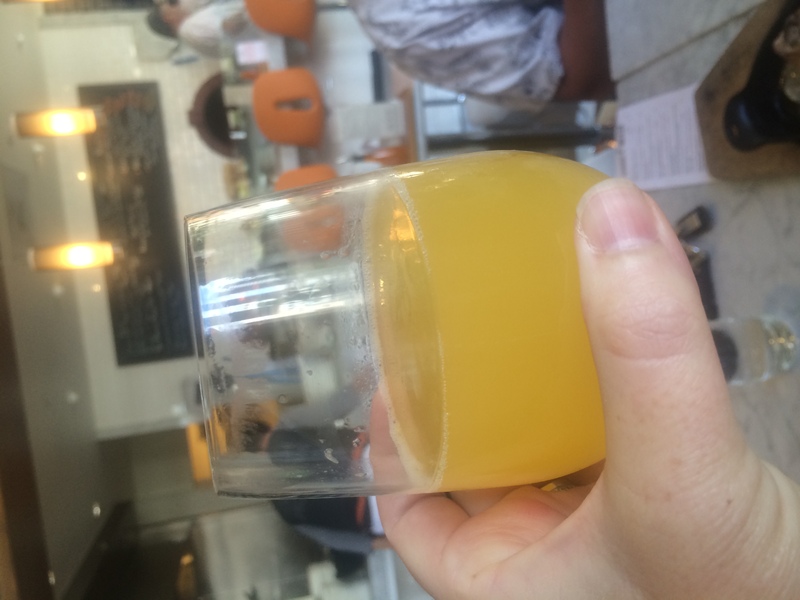 Does not include alcohol – guests can purchase and pay on their own. Join El Capitan Theatre for Tiny Tot Tuesday: The El Capitan Theatre will also host a very special Tiny Tot Tuesday for the first show every Tuesday during the run of Disney’s MARY POPPINS RETURNS. During these special screenings, parents and small children may enjoy the movie in a tot-friendly way—with lights dimmed rather than out and reduced sound levels. It’s such a great option to have for going to a movie. For more information about El Capitan Theatre please visit their site HERE, Join in on social by using and following along with #ElCapitanTheatre. 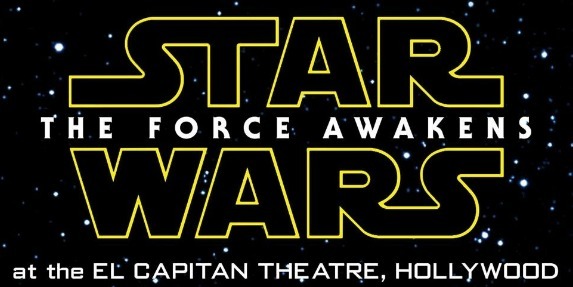 Images and logos are property of El Capitan Theatre and used with permission. Poster and trailer are property of Walt Disney Studios and used with permission. It’s almost time for the 3rd Annual Truck Adventures benefiting Make A Wish Foundation Greater Los Angeles! This year, the event will be held on Saturday, April 23, 2016, from 9am to 3pm at Santa Anita Racetrack. 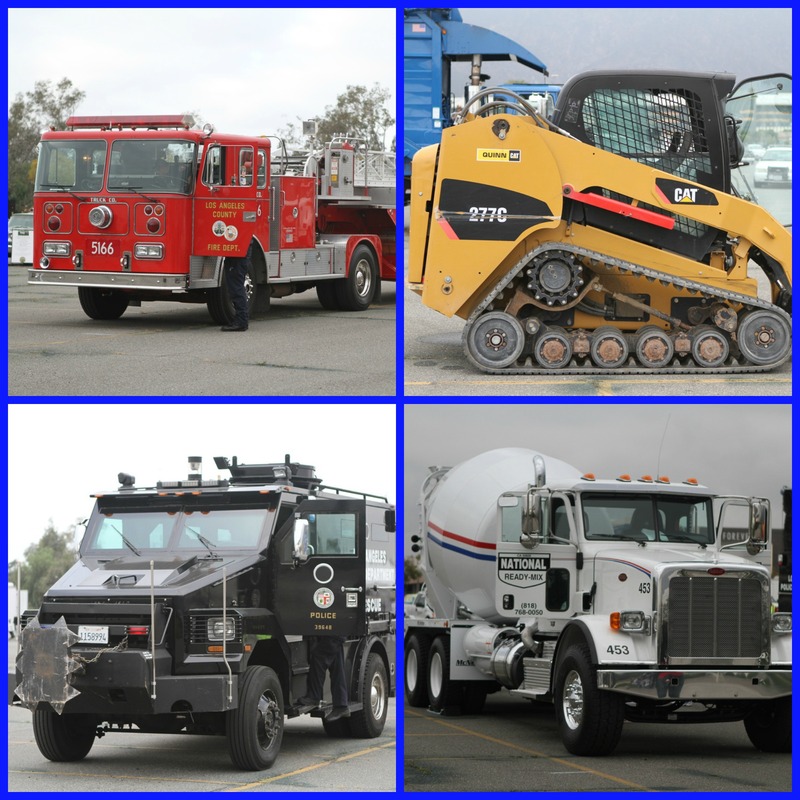 The event is designed to be a memorable experience that will allow children to see, touch and explore vehicles of all types such as fire trucks, police cars, construction, military vehicles and many other vehicles. This unique, fun filled event, allows children of all ages to get up close to and even sit in more than 90+ trucks and vehicles that they see on the road everyday. Some of previous year’s participants include Kraft Foods Oscar Mayer Wienermobile, Harley Davidson, LA County Fire Dept Shakey Quakey Van, Nickelodeon’s Sponge Bob Car, Fedex, Hertz, LA Port Authority TransPORTer, City of Hope, Colgate, Time Warner, DirecTV, AAA, City of Arcadia Police, Fire & Public Works depts, Sunstate Equipment, Quinn Rental, Caltrans, Los Angeles Police Department SWAT, DEA, Brinks Armored Trucks, US Forestry, Waste Management, Republic Services, US Navy, Army, Air Force, and Marine Corps, California National Guard, HD Forensic Scientific Investigation and many more. Some of the other fun activities for kids at the event will be provided by Home Depot’s Kids Workshop and Dave & Busters. Food trucks will also be available. To purchase tickets in advance, click here. Tickets may also be purchased on the day of the event. Santa Anita Racetrack is located at 285 West Huntington Drive, Arcadia, California. The event will be held next to Westfield Santa Anita Mall. Guests should enter through gate 3. Connect with Truck Adventures on Facebook and Instagram. This is not a sponsored post. All opinions are 100% my own. Images and logos are property of Truck Adventures. 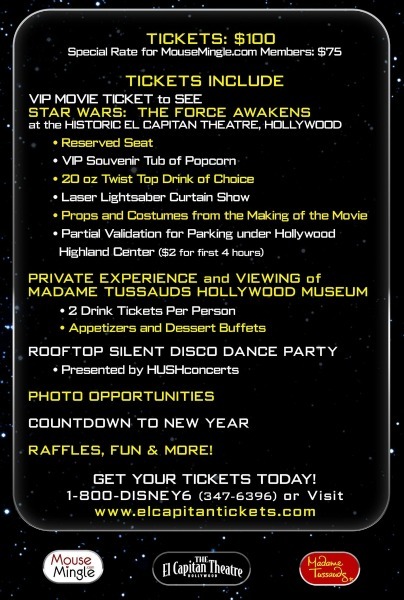 Attend The Ultimate Star Wars New Year’s Eve Event in Hollywood! Are you looking for something fun to do on New Year’s Eve this year? MouseMingle.com is throwing an ultimate Star Wars New Year’s Eve event in Hollywood and you’re invited! The event will be hosted along with the El Capitan Theatre and Madame Tussauds Hollywood for Disney fans and Disney-loving singles. 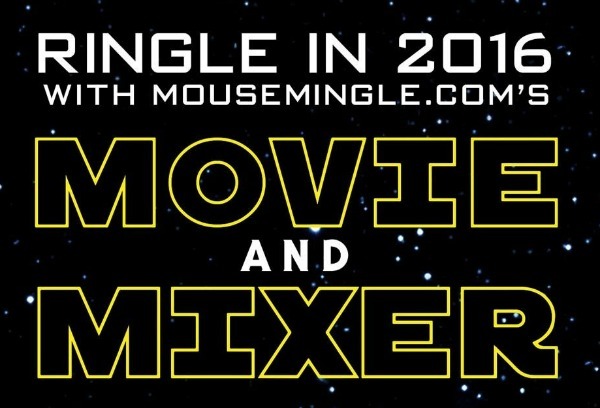 This “movie and mixer” is sure to be a blast and will feature the fun of a VIP screening of Star Wars: The Force Awakens, as well as a countdown, food, drinks, dancing and more! Attendees will also be able to view exclusive props and costumes from the making of the movie. This won’t be just another New Year’s Eve party; it will be the way to ring in 2016 for Star Wars and Disney fans looking to meet others with their shared passions. Although this event is hosted by MouseMingle, the most talked about dating site for Disney fans of 2015, it is not just for singles and will be a great night out for couples, as well. For more information about the event, click here. Connect with MouseMingle on Facebook and Twitter! This is not a sponsored post. All opinions are 100% my own. Images and logo property of MouseMingle and Disney. You Are Invited to the 2nd Annual Truck Adventures for Kids Benefiting Make-a-Wish For Kids Foundation Los Angeles! You are invited to the 2nd Annual Truck Adventures benefiting Make A Wish Foundation Greater Los Angeles on Saturday, April 25, 2015 from 9am to 3pm! This unique, fun filled event, allows children of all ages to get up close to and even sit in more than 50 plus trucks and vehicles that they see on the road everyday. Some of last year’s participants include Kraft Foods Oscar Mayer Wienermobile, LA County Fire Dept Shakey Quakey Van, Sponge Bob Car, Fedex, Colgate, Time Warner, DirecTV, AAA, City of Arcadia Police, Fire & Public Works depts, Sunstate Equipment, Quinn Rental, Caltrans, Los Angeles Police Department SWAT, Brinks Armored Trucks, US Forestry, Waste Management, Republic Services, US Navy, Army and Marine Corps, California National Guard, HD Forensic Scientific Investigation and many more. There will also be other activities, such as Home Depot’s Kids Workshop and food trucks. Prebuy discounted tickets at http://www.truckadventures.org. Santa Anita Racetrack is located at 285 West Huntington Drive, Arcadia, 91007. Hope to see you there! 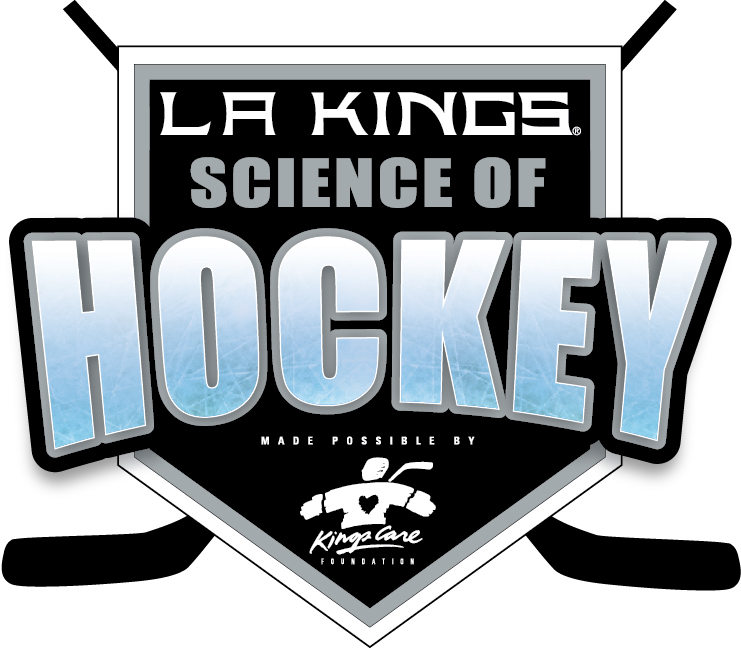 Discovery Cube LA Partners with the LA Kings to Open a New “Science of Hockey” Exhibit! 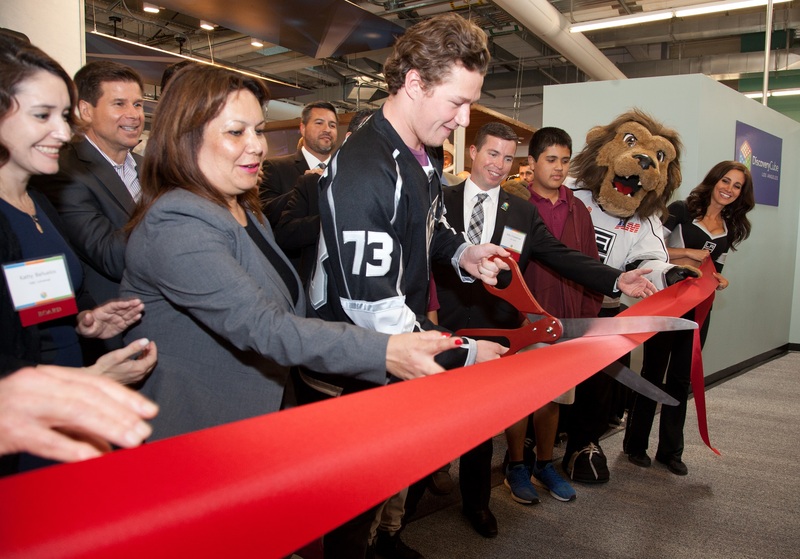 Science and Hockey fans alike now have something new to be excited about….The LA Kings Science of Hockey exhibit is now open at Discovery Cube Los Angeles (DCLA). Guests will be immersed in one of the most technically advanced sports-themed exhibits featuring the Stanley-Cup Champion Los Angeles Kings. This permanent attraction offers interactive learning focused on the science, math, and skills behind the thrilling sport of hockey. Designed and produced by BaAM Productions, the new, second-floor Science of Hockey exhibit is one of more than a dozen highly interactive, science-based attractions now featured on the 2.5-acre site of DCLA in the Hansen Dam Recreational Area. According to Kafi D. Blumenfield, DCLA Executive Director, the Science of Hockey provides guests with an up-close look at the sport of hockey and the team while discovering the fascinating science behind the game. DCLA partnered with the Kings Care Foundation and BaAm Productions to ensure the exhibit was as interactive and realistic as possible. Visitors enter the exhibit through a replica of the iconic LA Kings Player Tunnel at STAPLES Center and find hands-on exhibits that provide exclusive access to the sport and the team. You Be the Goalie / You Be the Shooter – Participants in this unique, in-the-game experience don a blocker and glove to try and stop pucks shot from virtual versions of LA Kings players Dustin Brown, Drew Doughty and Jeff Carter. If they choose to turn the tables, and take shots on LA Kings goalie Jonathan Quick in “You be the Shooter,” they are rewarded with instant speed and accuracy readings. Zamboni Test Drive – Occupying the center of the Science of Hockey is a replica Zamboni offering guests the once-in-a-lifetime chance to climb aboard, turn the auger and get the feel of driving this iconic, ice-resurfacing machine. A scale replica of the STAPLES Center scoreboard overhead provides the perfect photo opportunity. Suit Yourself – NHL hopefuls can use interactive touch screens to design their very own jerseys and then capture and add their own likeness before the highly personalized image is displayed on a large screen. Healthy Locker Room – Guests learn about training and nutrition by playing interactive games in this unique, technically advanced replica of the LA Kings locker room. Hands-on participatory consoles at each players’ locker provide memorable opportunities for individual and group play and discovery. Skater Challenge – Intrepid skaters can follow Dustin Brown or LA Kings mascot Bailey around the ice to test their skating ability and speed. The faster the visitor skates, the faster the on-screen LA Kings player or mascot moves. The Science of Hockey is included in general admission to DCLA. 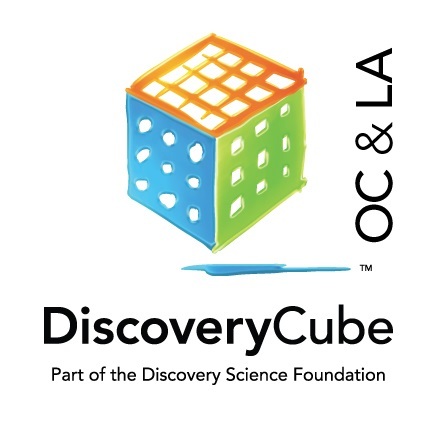 Tickets to DCLA can be bought online at http://www.discoverycube.org/la/ or on campus. General admission prices are as follows: adult ($16.95), senior ($12.95), and children 3-14 ($12.95). Now through June 30th, there is special admission pricing of just $10 for everyone. 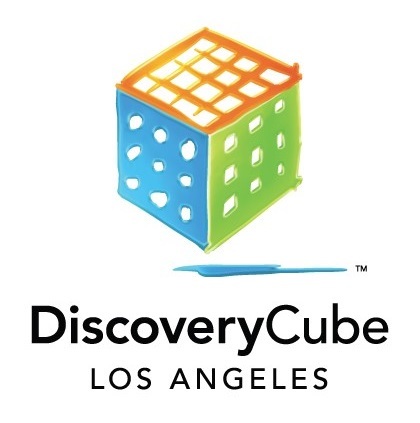 Connect with Discovery Cube LA on Facebook, Twitter, and Instagram! Lunar New Year is the most celebrated holiday of the year for the nearly 1.5 million people of Chinese, Korean and Vietnamese descent living in Southern California. Celebrate Lunar New Year by visiting the 116th Annual Golden Dragon Parade and Festival in Los Angeles’ Chinatown. With colorful parades, elaborately decorated floats, marching bands and cultural performances by some of the nation’s best Chinese acts, this free event is fun for all ages. 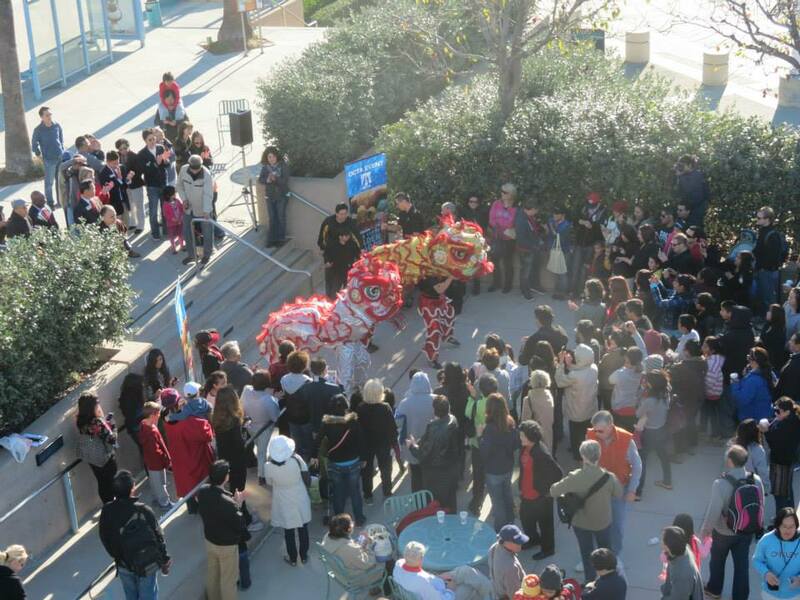 Before riding Metrolink to L.A. on February 21, join OCTA for a Lunar New Year celebration at the Irvine station. This is a free event for the whole family. Just arrive at the Irvine Metrolink Station at 8:00 a.m. Enjoy a traditional Lion Dance and enter to win Lucky Red envelopes. 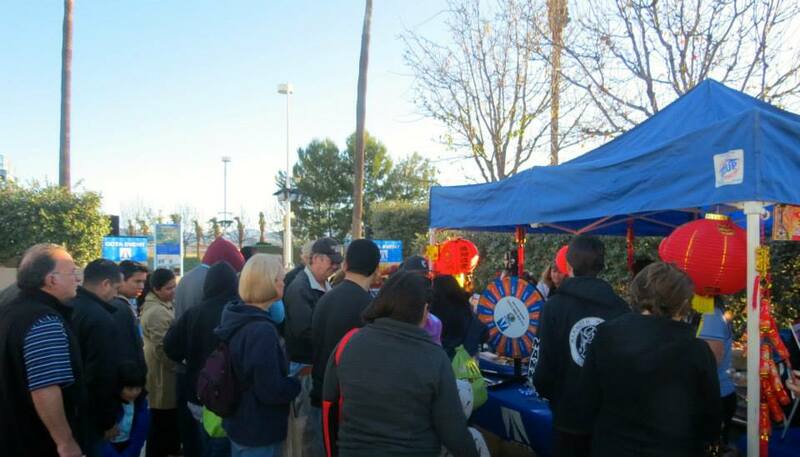 Bring a non-perishable food donation for Second Harvest Food Bank of Orange County to play Plinko and win a prize. Metrolink is the best way to get to LA from Orange County. You’ll avoid traffic and parking hassles and enjoying a relaxing ride with friends and family. The train is a great way to start your family adventure to Los Angeles. 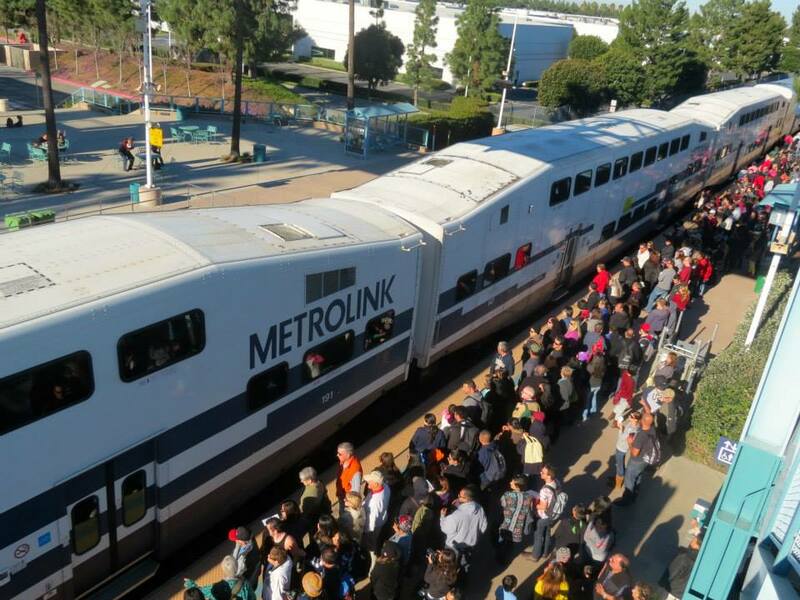 For more information about Metrolink and to find the train schedules, click here. Connect with OCTA on Facebook and Instagram! 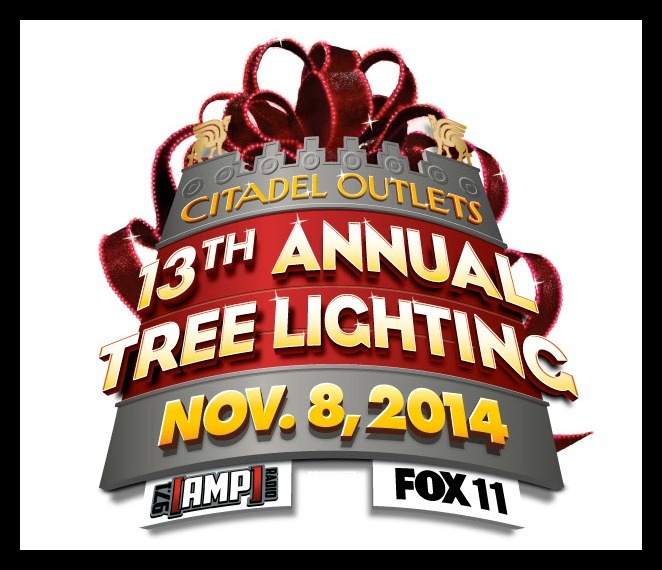 The 13th Annual Tree Lighting Concert at The Citadel Outlets on November 8! Disclosure: This is not a sponsored post. I was provided with information and details about this event to share with my readers. All opinions are 100% my own. If you’re looking for a fun way to kick off the holiday season with something fun, you should consider attending the 13th Annual Tree Lighting Concert on November 8, at the Citadel Outlets! This event has become a holiday tradition in Los Angeles and is expected to draw over 20 thousand attendees to witness the lighting of the World’s Tallest Live Cut Christmas Tree (115-ft), see the World’s Largest Bow atop the Citadel wall and enjoy the free, outdoor concert headlined by country star Jana Kramer, The Voice’s Christina Grimmie, YouTube sensation Cimorelli, pop boy band After Romeo and X Factor’s Josh Levi. Presented by AMP 97.1 and FOX 11, television personalities Tony McEwing and Maria Sansone and radio personality McCabe will host the night’s events. Immediately following the concert performances, Tony & Maria will direct attention to center court where guests will be invited to participate in a countdown leading up to the lighting of the World’s Tallest Live Cut Christmas Tree. 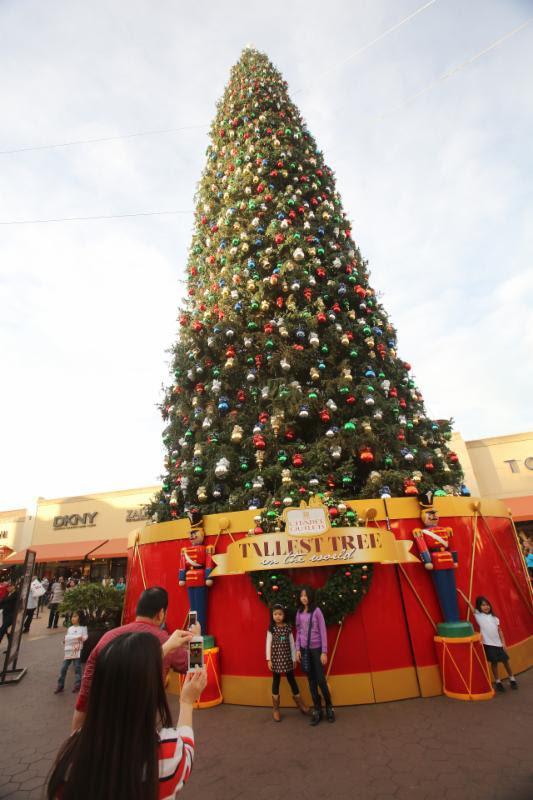 The Citadel Outlets’ record-breaking tree is an impressive 115 feet talk and is sourced from the Shasta-Trinity National Forest. It spans 20 feet longer than an NBA basketball court and stands at twice the size of the famous Hollywood Sign. In addition, the center’s Christmas tree is 40-feet taller than the Rockefeller Christmas Tree in New York City. In addition to hosting the World’s Tallest Live Cut Christmas Tree, Citadel Outlets is also home to the World’s Largest Bow. Sitting atop the iconic Citadel wall overlooking the 5 Freeway, the World’s Largest Bow is 36 feet wide by 21 feet tall with 18 loops and two 72-feet long tails that drape down the front of the building. Over 4,000 cans of red paint and primer and one half-ton of glitter were used to cover the striking accouterment. Event attendees are encouraged to bring gift donations for Children’s Hospital Los Angeles. To maintain safety and well being of CHLA patients, only new and unwrapped toys will be accepted. Please note that CHLA cannot accept stuffed toys or toys with small pellets or beans. All donations should be non-toxic, free of sharp edges and cannot promote violence and/or aggressive behaviors. Thanks to generous supporters CHLA is able to gift approximately 80,000 toys per year. 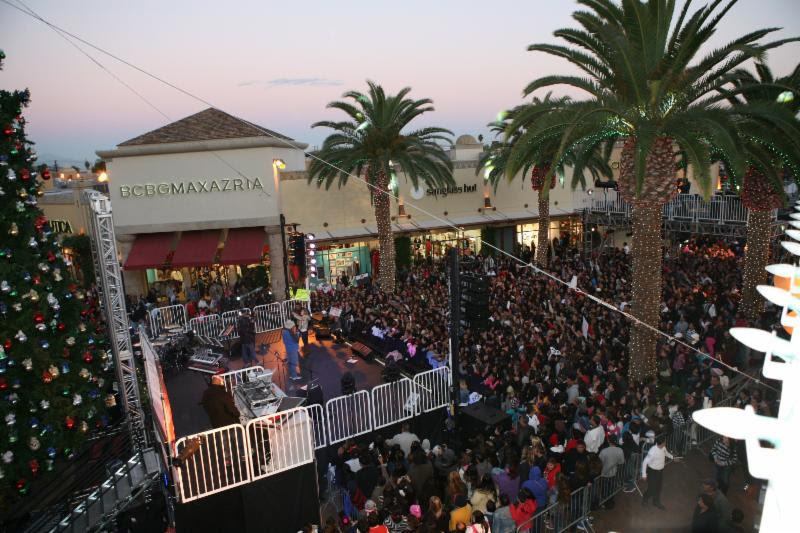 Previous headline performers to grace the Citadel Outlets’ stage include Jesse McCartney (2013), Ariana Grande (2012), Big Time Rush (2010), Justin Bieber (2009), Ashley Tisdale (2009), Demi Lovato (2008) and many more. 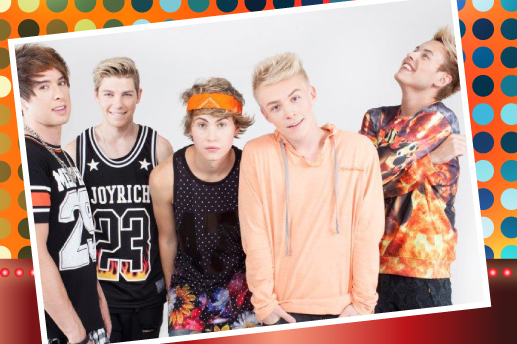 After Romeo – The Los Angeles-based, five-person boy band reached number one on the MTV music charts with Free Fall. 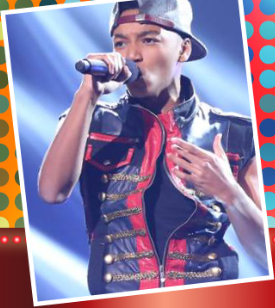 After Romeo’s songs have been playing on-air Radio Disney and have reached number six on their countdown. Hits singles include Love on Lock, One Night and Save Some Snow. 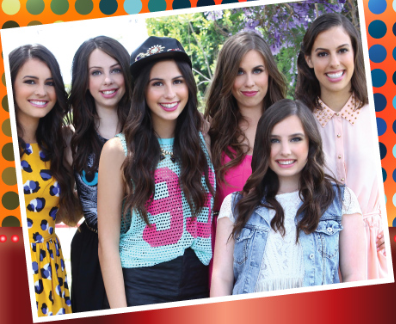 Cimorelli – Winners of 2013 Teen Choice Awards for Choice Web Star, Cimorelli is a six-woman band comprised of sisters with a passion for singing. With almost 3 million subscribers on YouTube and music deal with Universal Records, Cimorelli is enjoying a meteoric rise. They are set to release their latest EP, Renegade, on October 27, 2014. 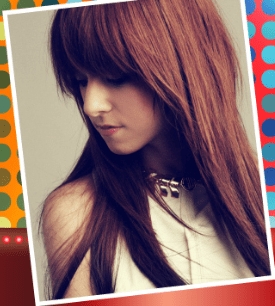 Christina Grimmie – The American singer/songwriter finished in third place on Season 6 of NBC’s The Voice. Grimmie’s studio version of her performances reached top 10 on iTunes charts. She released Must Be Love early in July and has been touring with previous contestants of The Voice. Jana Kramer – The Country-singing sensation and One Tree Hill star’s hit “Why Ya Wanna” reached number 3 on the US Billboard Hot Country Songs Chart and has grown in popularity ever since. In 2013 Kramer won Top New Female Artist at the American Country Music Awards. She is currently on tour performing her new songs Deal Breaker, Pop That Bottle and Don’t Touch My Radio. Citadel Outlets is located just off the Interstate 5, just 10 minutes south of downtown Los Angeles, at Atlantic Blvd North at100 Citadel Drive, Suite 480 Los Angeles, CA 90040. For more information please visit http://www.citadeloutlets.com. For updates on the tree lighting ceremony and holiday concert, please follow us on Facebook http://www.facebook.com/CitadelOutlets. All images property of Blaze PR and The Citadel Outlets. I Got My Brunch On at Michael’s Pizzeria in the Long Beach Downtown Promenade! One of my most favorite things about living in Southern California is the fact that there is SO much to see and do here! We recently decided to take a short drive down to Long Beach. 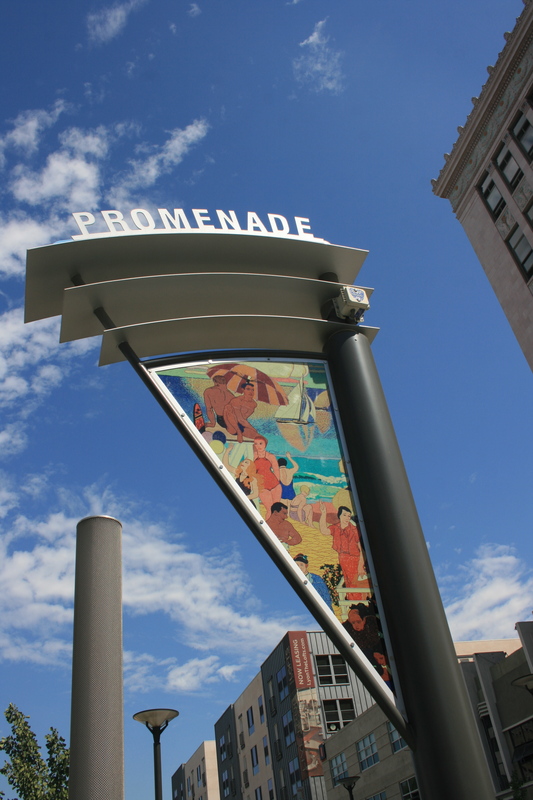 The Downtown Promenade area of Long Beach is so cool. Along the promenade, you can find this adorable little Italian restaurant called Michael’s Pizzeria. It has a charming outside patio area (as well as inside seating) and even an area to park your bike! I had seen pictures of Michael’s delicious pizzas before on their Instagram page, but we specifically made the trip on this particular day to try out some of their brunch menu. 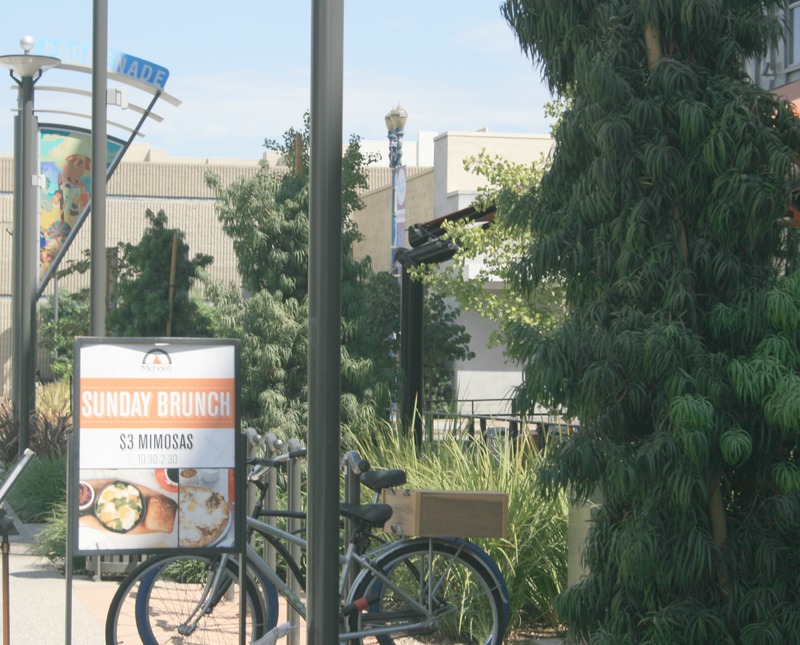 The brunch menu is served on Saturdays and Sundays and features several wood-fired cast iron frittatas, as well as sweet items such as cinnamon rolls, french brioche french toast, and pancakes. Other items available during brunch hours include wood-fired organic eggs, fennel sausage, smoked bacon, and garlic-roasted new potatoes. 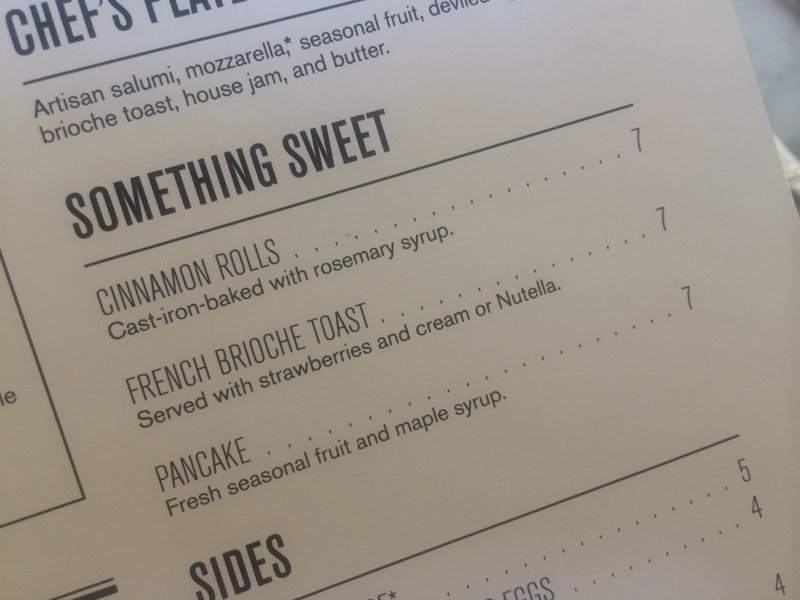 I also need to mention that they have NUTELLA to put on your toast and your french toast! Wow! I’d already seen a picture of Michael’s homemade cinnamon rolls on Instagram, so I knew I was destined to have some of my own. We started out with an order of the cinnamon rolls. Next, a Salsiccia E Funghi frittata arrived at the table. 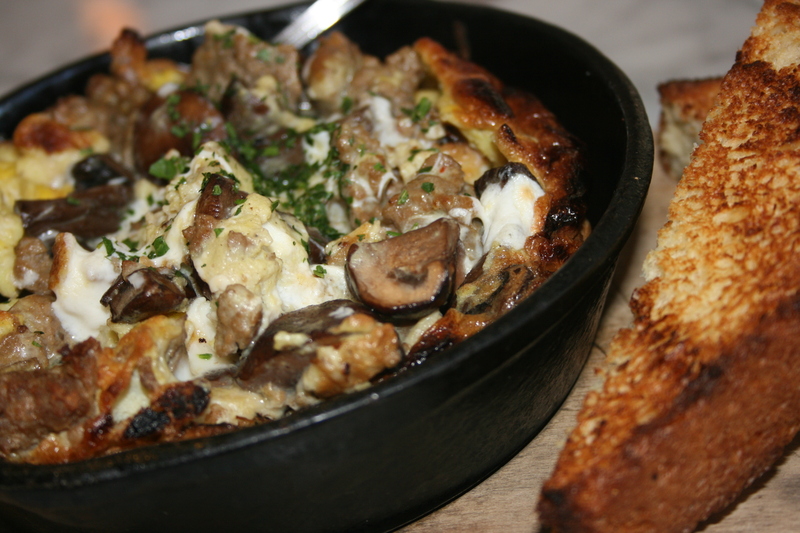 It’s made with 2 organic eggs, fennel sausage, and mushrooms and wood-fired in the oven. I love the presentation of the cast iron skillet. 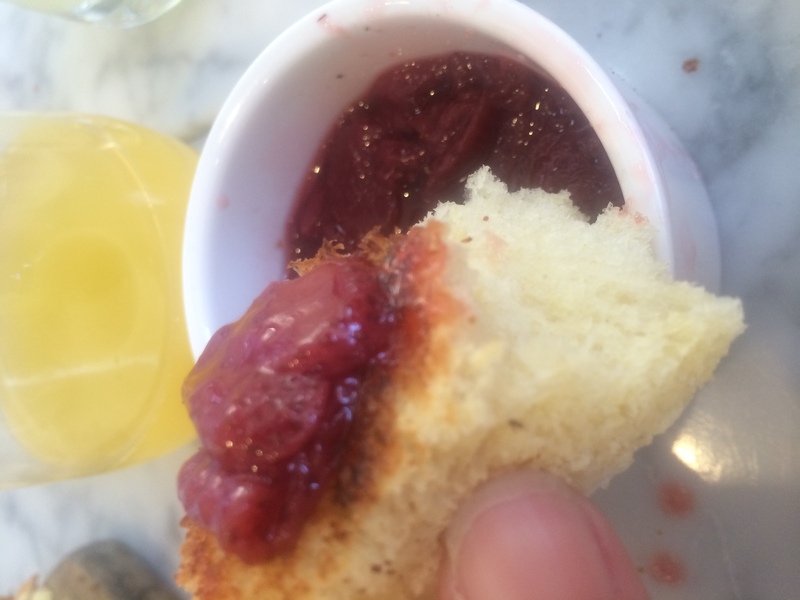 All of the frittatas are served with a side of brioche toast and house-made jam, which was strawberry. Yum! We were just getting the party started when a Carbonara Pizze Bianca showed up at the table. This pizza is like a foodie’s dream. 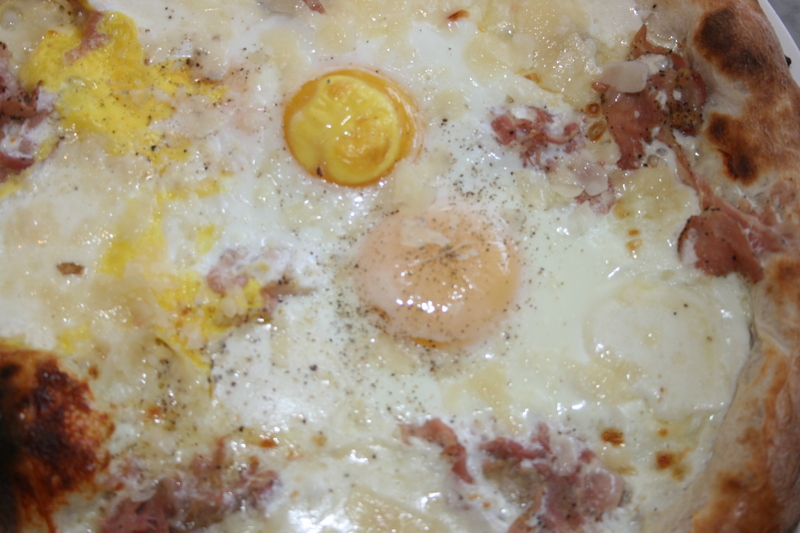 It’s made with provolone, mozzarella, and pancetta….and then topped with 2 eggs! Breaking the egg yolk on top of the pizza just brought out even more flavor! 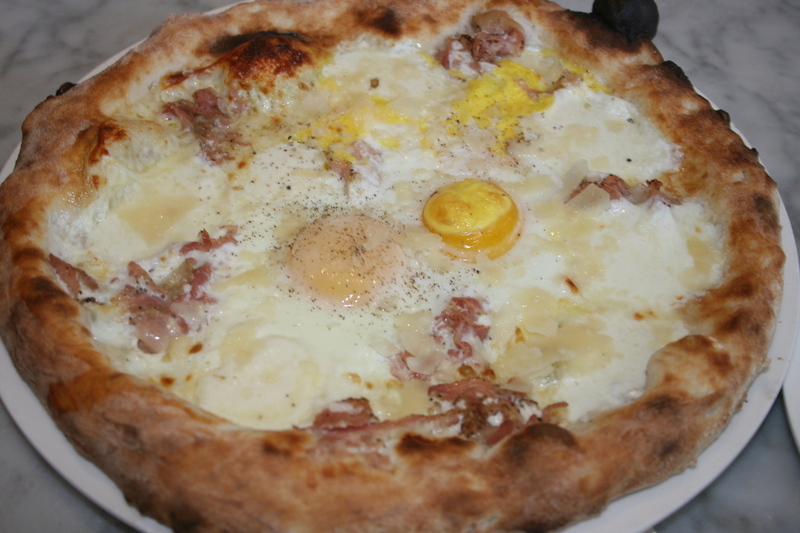 This pizza is actually part of the regular menu and not specific to the brunch menu so you can order it anytime! 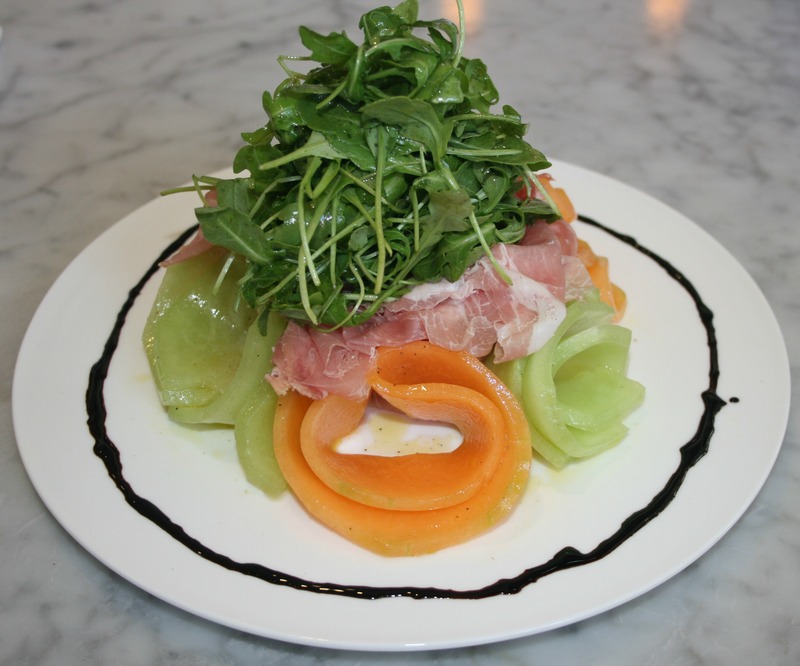 We slowed down a little bit with some light, refreshing Prosciutto and Melone. 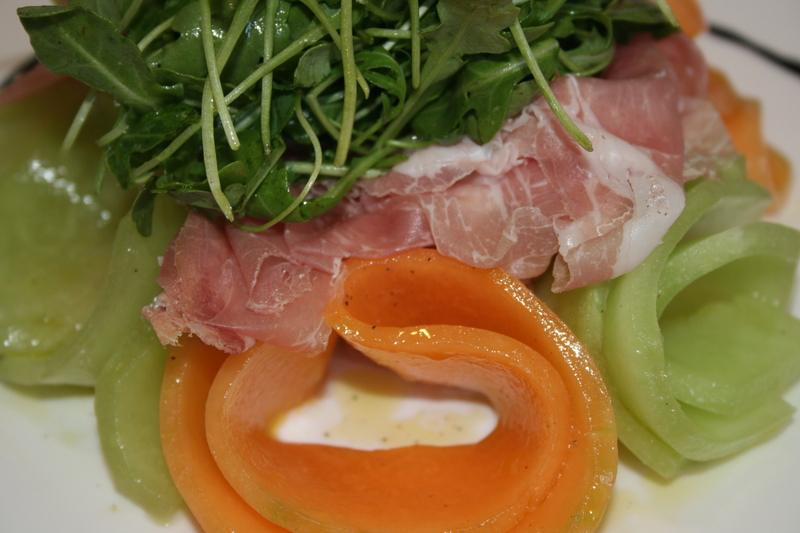 The cantaloupe and honeydew served with Parma ham was so pretty to look on the plate. It was especially delicious and tasted so fresh when it was combined with the arugula and balsamic. You can tell something is great if a kid will eat it and Emi was doing just that. We then ventured back to meet a couple more pizzas. The first one was a Margherita Pizza. Tomato, mozzarella, basil, and extra virgin olive oil. The second one was something featured on the special chalkboard menu that sits above the wood-fire oven. 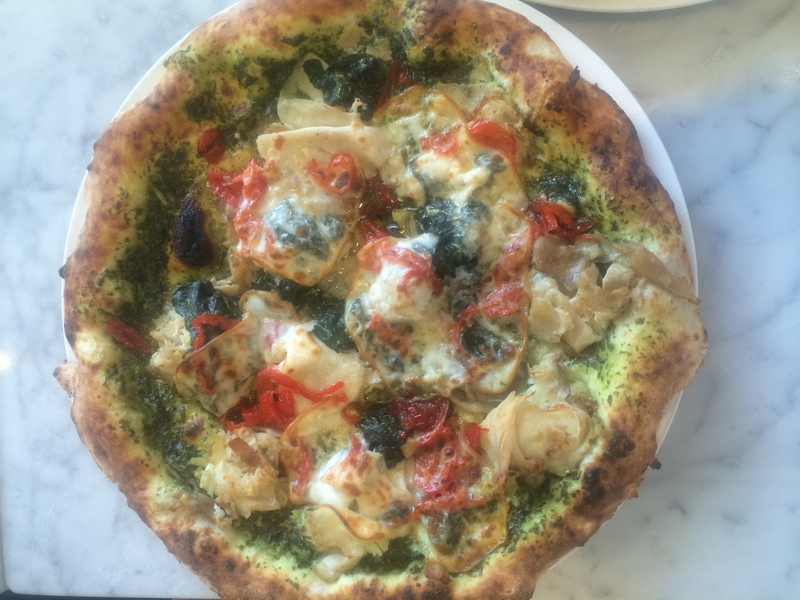 It was called the Porchetta Pizza and was made with pesto, porchetta (slow-roasted pork belly), smoked mozzarella, peppadews, and garlic spinach. It was loaded up with so much flavor! Even though we were getting pretty full from all of the delicious food, we knew we still HAD TO have dessert! From the start, Emi had been eyeing the gelato she’d seen on the menu. There are about 8 different flavors of gelato to choose from each day at Michael’s. 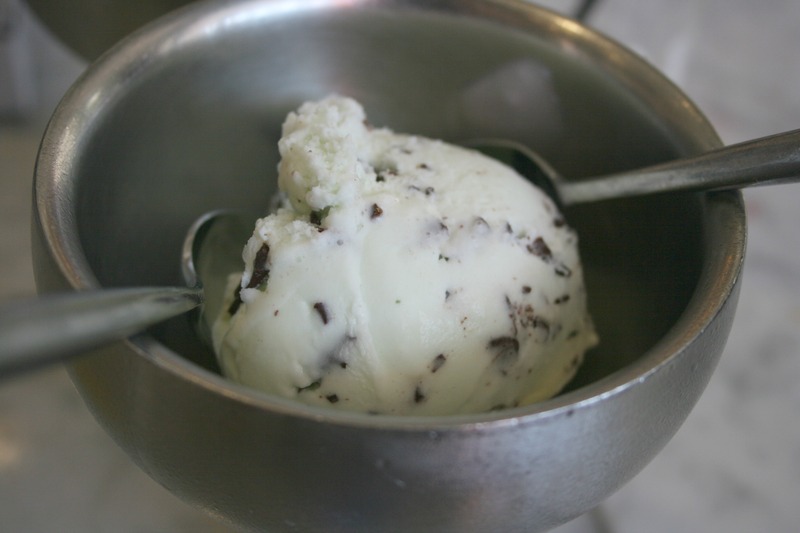 We finally decided to try the Salted Caramel and the Mint Chocolate gelatos. 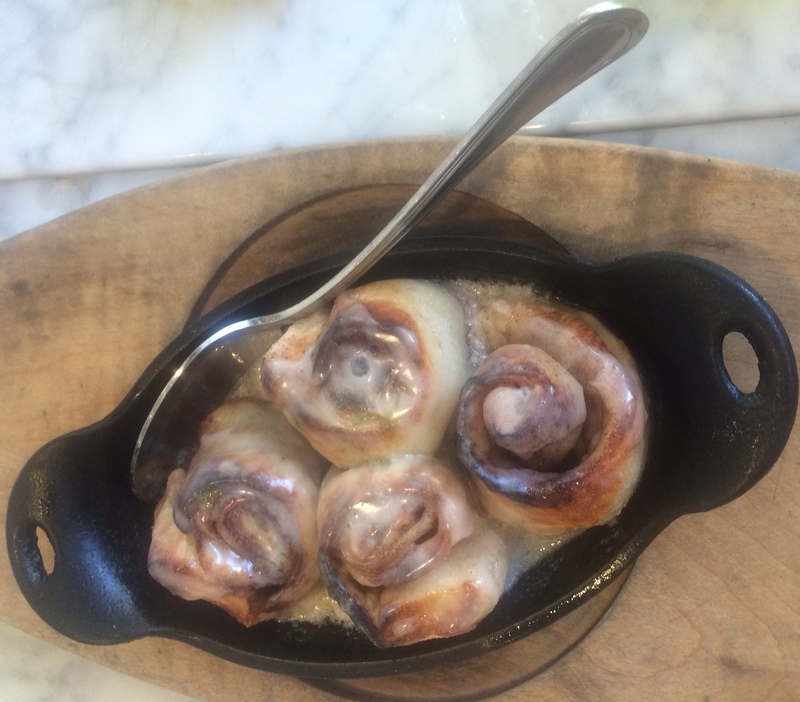 They were so light and flavorful and were just enough to top off our great brunch! I especially enjoyed getting to chat with the manager, that day. He is so passionate about what they’re doing over there and talked extensively about the way the foods are all prepared fresh daily and how they only use the freshest ingredients. They really pride themselves on bringing the best foods to the table for their customers. He explained each and every detail about the items we were sampling that day. I learned something about pizza slicing too. The pizzas arrive at your table unsliced. 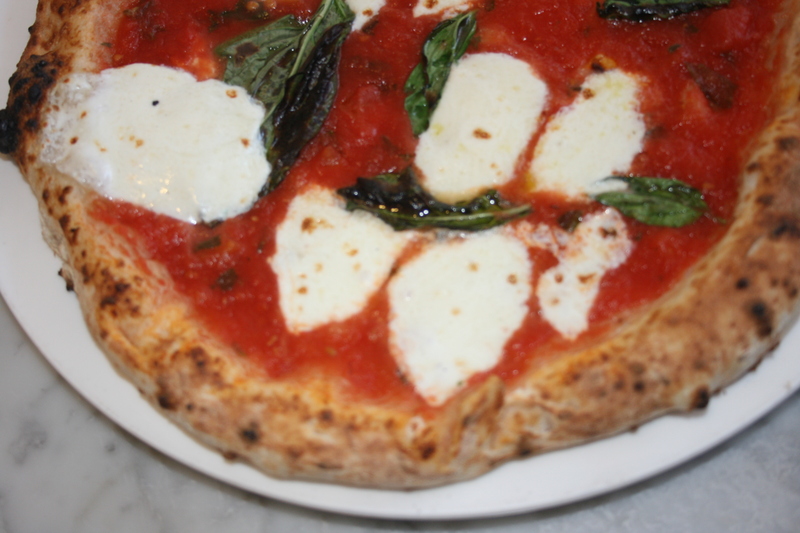 Michael’s Pizzeria follows what the natives in Naples do, by serving pizzas unsliced because they believe that slicing a pie immediately after it comes out of the oven, causes moisture to form beneath it. 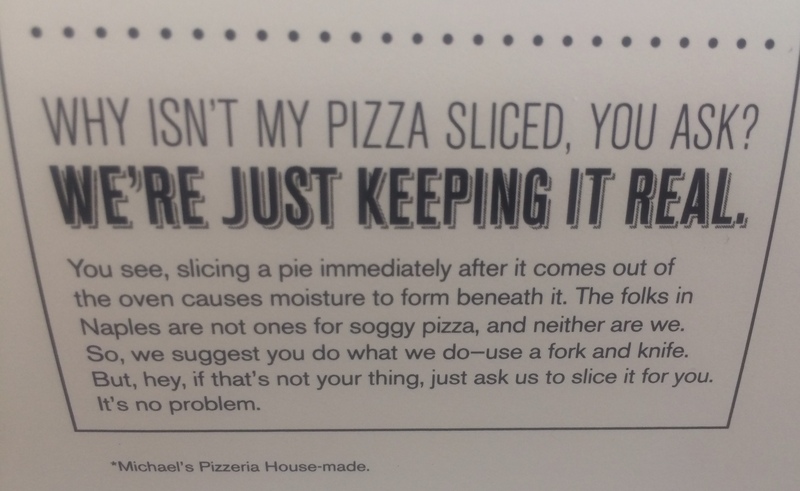 They want to make sure your pizza does not end up soggy and suggest cutting it with a knife and fork as you enjoy it, but will slice it for you upon request. I love this! 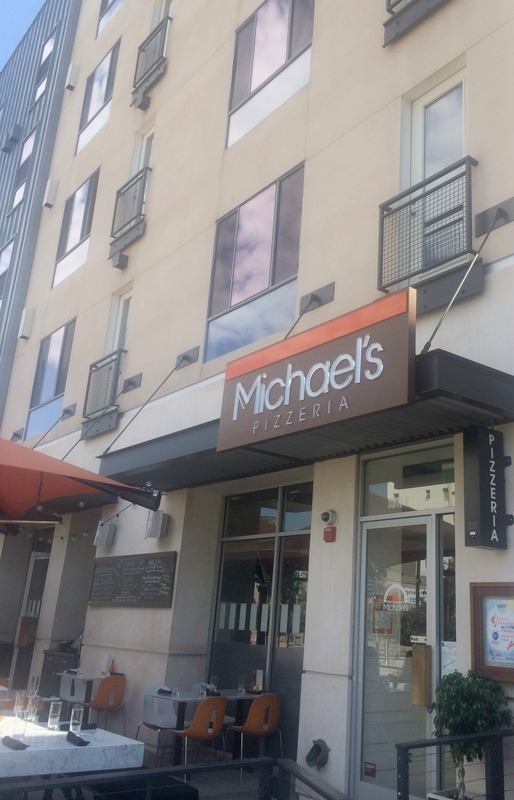 Michael’s Pizzeria is definitely somewhere I’d recommend to others. They have 2 locations in Long Beach, on 2nd street and on the Downtown Promenade, as well as a location in Rancho Mirage. (I know where we’re going the next time we visit Palm Desert). 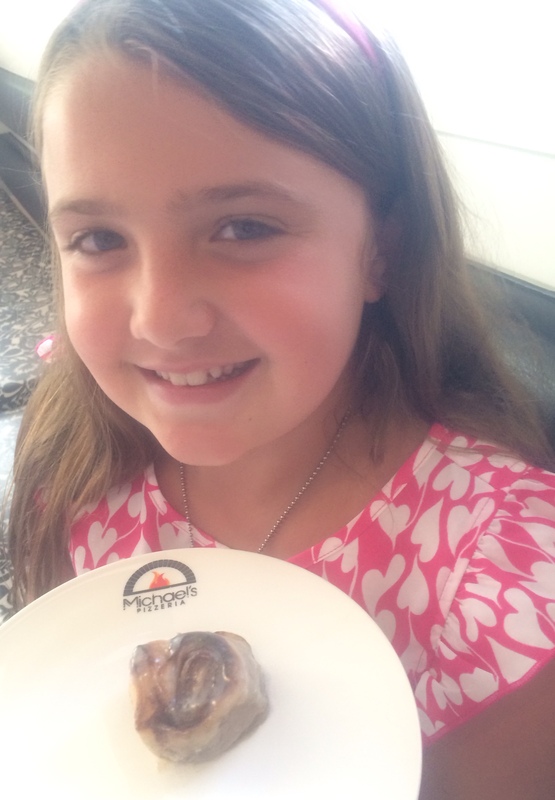 The restaurant is family friendly and has something for everyone on it. 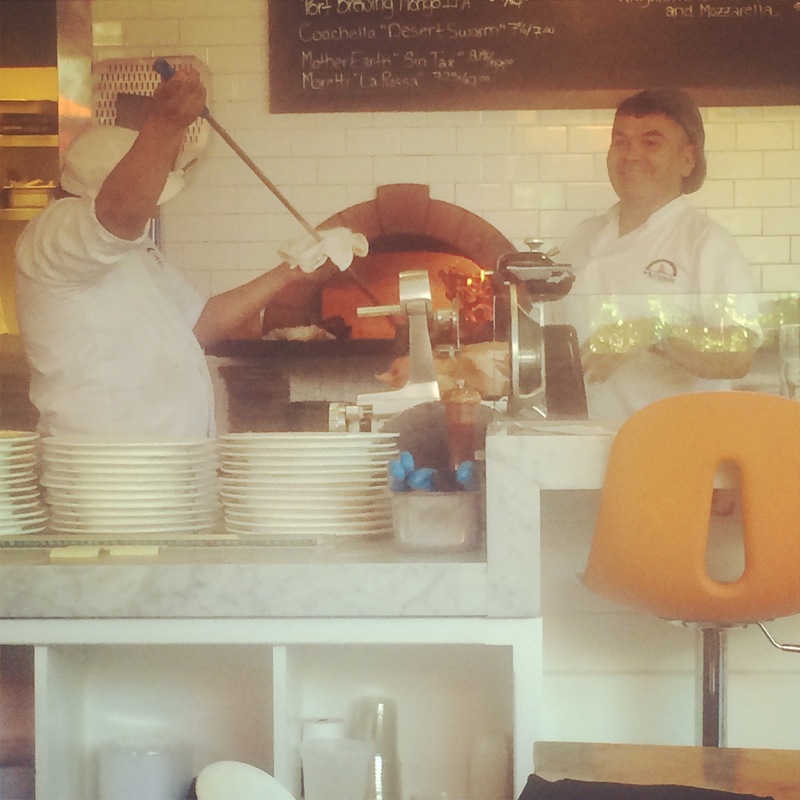 Kids will love hearing the kitchen staff shout “Pizza!” every time they take another pizza out of the wood-fire oven. (Ok I’ll admit I loved that part too and may have joined in too) I cannot wait to go back and try more items from their menu. I know you’ll love it too!